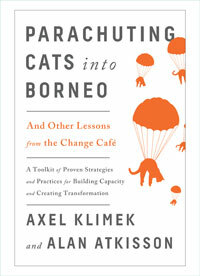 "AtKisson (Believing Cassandra) and Klimek, cofounders of the Center for Sustainability Transformation, offer a shrewd and discerning look at systemic change within organizations and the many obstacles to such change. The coauthors do not claim to have a one-size-fits-all solution, rather telling the reader that the 'answers are already there within yourself' or close at hand, among your colleagues. However, they do urge readers to shift the odds in their favor by building on existing knowledge, seeking out new viewpoints, becoming more mindful of ingrained habits, and focusing on their strengths and resources. Klimek and AtKisson offer up 'four big questions:' 'What basic beliefs do we have? '; 'What method do we have for supporting a system to move from state A to state B? '; 'What is our relationship to the system? '; and 'How can we increase the capacity of the system not just to change but to improve performance?' Elsewhere, they identify seven different ways of approaching change, including 'following a plan,' 'negotiating an outcome,' and 'enforcing the future.' They close with insightful chapters on supporting others, coaching, and leadership that will be particularly valuable when initiating change but should be equally beneficial to daily work life."